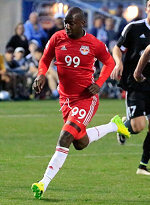 The New York Red Bulls defeated FC Tucson, 3-1 in a preseason scrimmage on Saturday evening. New York got goals from Sal Zizzo, Gonzalo Veron and Brandon Allen. It was the first game action for veterans Luis Robles, Bradley Wright-Phillips and Sacha Kljestan, who rejoined the team this week. Wright-Phillips played 65 minutes, while Kljestan and Robles played the full 90. Zizzo opened the scoring late in the first half, getting on the end of a Kljestan corner kick and driving a low ball through traffic and inside the far left post. On the other side of halftime, Veron doubled the lead by making the most of a one-on-one chance. Veron ran onto a leading pass, wrong-footed a defender and fired a shot that deflected off of a defender and in. Allen replaced Wright-Phillips in the 65th minute, and got on the score sheet minutes later. The forward made a run to the back post and was rewarded with a tap-in finish on a feed from fellow homegrown Derrick Etienne Jr.